Thinking of selling? Our proven commission sale or SOR (Sale or Return) program is a great way to utilise and access our professional services and facilities while still maximising the return from your vehicle with minimal hassle, stress and time, If you?d like to take advantage of this then please get in touch for further information. Alternatively If you?d like to move your vehicle on quickly and efficiently with minimal delay then we can make an offer on an outright purchase basis with payment and collection arranged soon after. 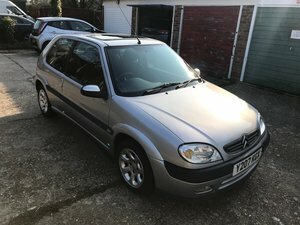 An unmodified Citroen Saxo VTR with 52,519 miles and full service history. Sports styling with painted bumper skirts and wheel arch extensions, body colour door housing mirrors and handles, rear spoiler, tinted glass, front fog lights, driver’s airbag, front seatbelt pretensioners, energy absorbing side impact protection, power assisted steering, alarm, remote central locking, electric and heated door mirrors, slide/tilt sunroof, electric windows, white instrument dials, rev counter, split folding rear seats, RDS radio with single CD player. Factory options; Metallic paint. 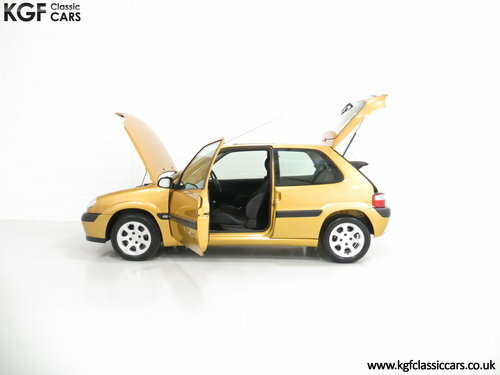 This brilliant VTR hot hatch is finished in factory optional and desirable Topaz Gold Metallic, (Code KAU). This standard example has thankfully avoided the boy racer fate that befell most cars and the paintwork looks superb with a bright polished finish. Incredibly, the lightweight factory panels and trim sections are in good condition, (the unladen weight is only 935kg!). Minor age related markings and stone chips can be seen, and there is light distortion to the nearside rear lower plastic trim, utterly insignificant. The glass is factory fitment with original stickers and the driver’s door aperture still displays the factory build label. A rare find in factory standard specification and certain to stir up youthful nostalgia for an entire generation of petrolheads! 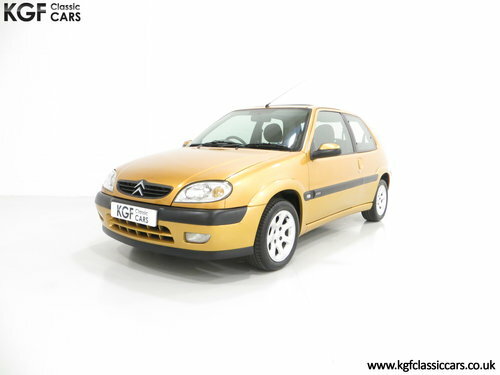 The care bestowed on this cherished car is clearly evident in the excellent condition of the fragile interior. The original Delta cloth upholstery only fitted to the VTR model is clean and unworn along with the pristine door inserts. The headlining, plastic trim and fascia are perfect and fully functional white dials remind the driver of the sporting credentials. The original RDS radio with single CD remains fitted and operational. The boot area containing the wheel brace and towing eye is very clean and displays PDI markings and the original metal data plate. 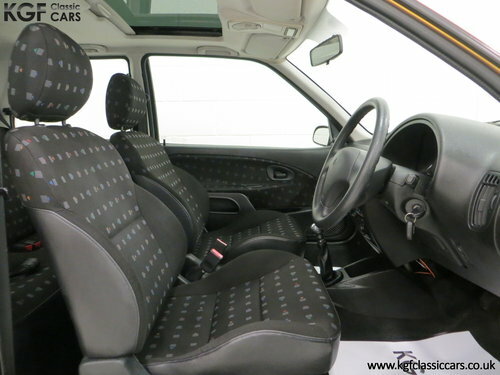 A very clean and unspoilt interior. 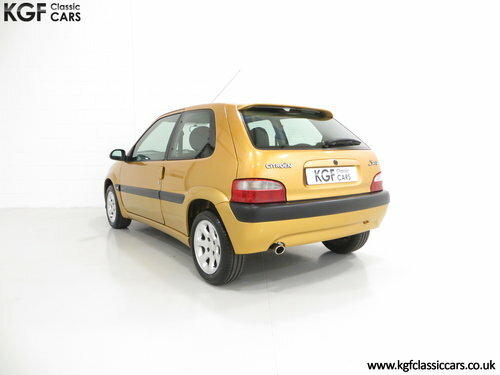 This Mk2 VTR is fitted with the revised 97bhp four cylinder 1.6L 8 valve engine. A top speed of 120mph and 0-62mph in 9.4 seconds is quoted and this lively little car is huge fun to drive. The engine bay remains exactly as intended and displays factory stickers, plates and panel stampings. The five-speed manual transmission offers light and direct changes with a sporty feel. The factory fitted 14” Toulouse alloy wheels remain in excellent condition with only light markings and no kerb damage. Brand new quality Dunlop Sport bluresponse 185/55 R14 tyres were fitted in January 2019. The servo assisted brakes with discs all round provide safe assured stopping power. 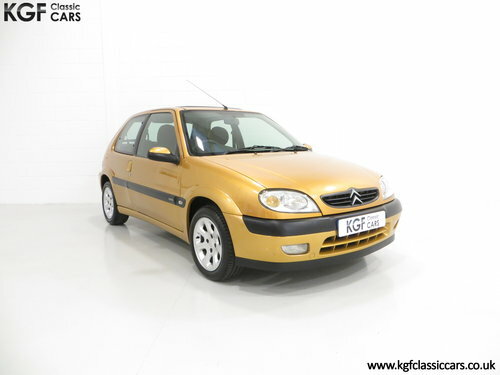 Registered new on the 3rd September 2001 by Citroen Main Dealer Broads of Chalfont Ltd, this example has covered just 52,519 miles from new with three owners in total. The full service history consists of the original service book containing all dealership guarantee stamps plus 10 service stamped entries, including the latest cambelt change in May 2016 at 46,522 miles. The full original Citroen document wallet containing all handbooks, guides and point of sale literature as well as the original PDI check sheet. A further folder contains MOT certificates and maintenance invoices, and there are two original Citroen keys present. 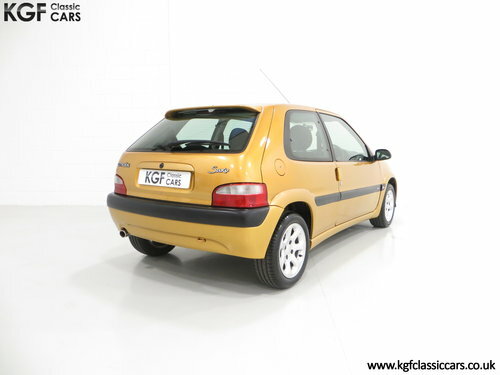 Representing a very rare example of an often modified and abused hot hatch, the classic car world is quickly realising the increased desirability of sporting Saxo’s with good examples very difficult to find. 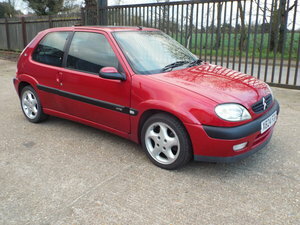 A fine example of a future classic, Saxo,now quite rare in Burgundy Red. 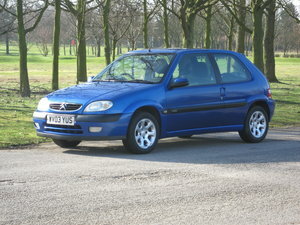 Three door hatchback, Radio/cd stereo Body work in very good condition, hardly a blemish. No MOT. Mileage 55.800. Blue/grey cloth upholstery, looks like new. Newish battery. Two keys. 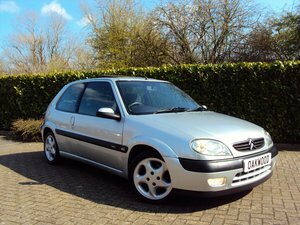 Great runner and economical.